Frequently, machine learning problems in the real world suffer from the curse of dimensionality; you have fewer training instances than you’d like and the predictive signal is distributed (often unpredictably!) across many different features. Sometimes when the your target variable is continuously-valued, there simply aren’t enough instances to predict these values to the precision of regression. In this case, we can sometimes transform the regression problem into a classification problem by binning the continuous values into makeshift classes. To help the user select the optimal number of bins, the BalancedBinningReference visualizer takes the target variable y as input and generates a histogram with vertical lines indicating the recommended value points to ensure that the data is evenly distributed into each bin. Implements histogram with vertical lines to help with balanced binning. 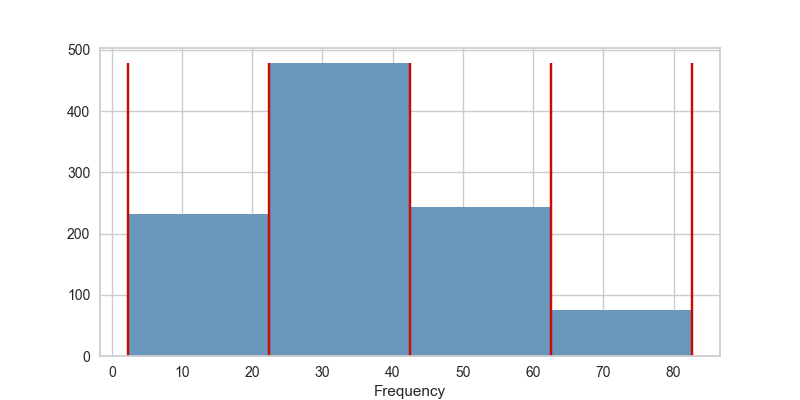 BalancedBinningReference generates a histogram with vertical lines showing the recommended value point to bin your data so they can be evenly distributed in each bin. This is inherited from FeatureVisualizer and is defined within BalancedBinningReference. Draws a histogram with the reference value for binning as vertical lines. Sets up y for the histogram and checks to ensure that y is of the correct data type. Fit calls draw. Creates the labels for the feature and target variables.